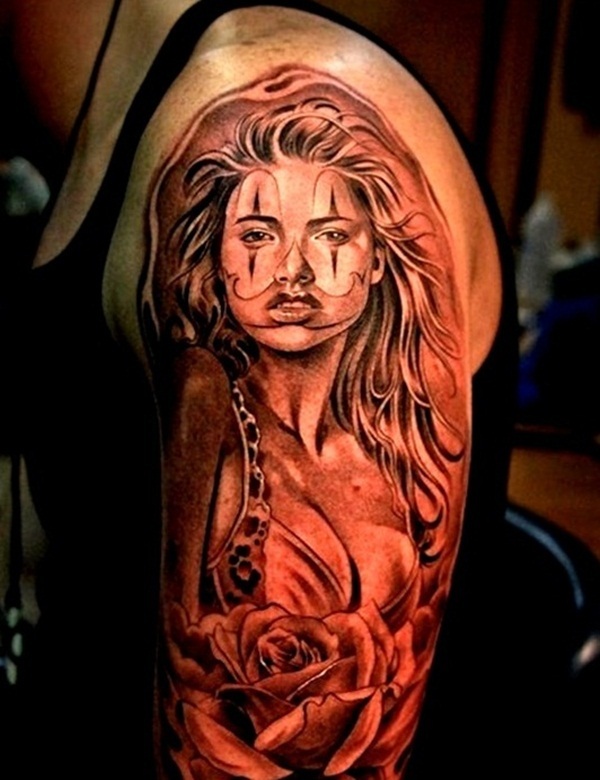 Pin-up tattoos are an expression of the beauty of females. 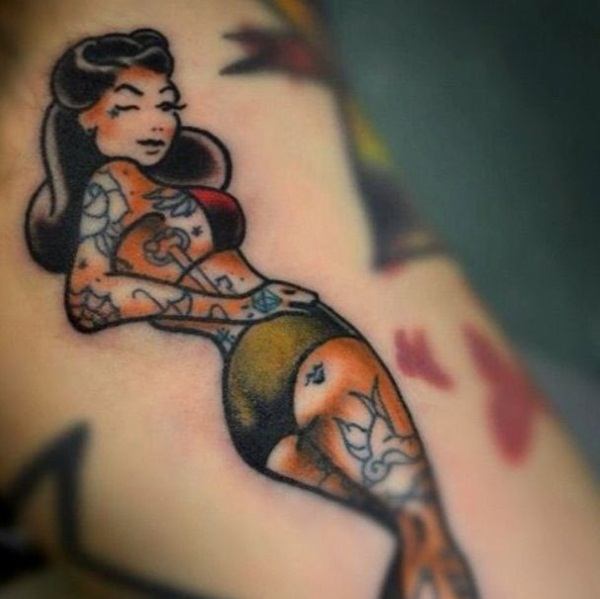 Pin-up tattoos are awesome old school designs that can look great on both men and women. 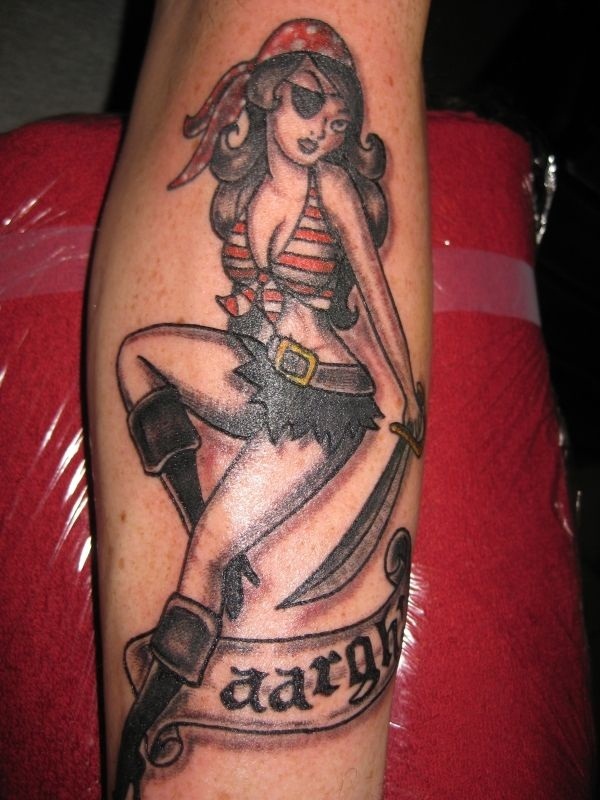 These tattoos were popular with sailors and became part of pop culture during that time. 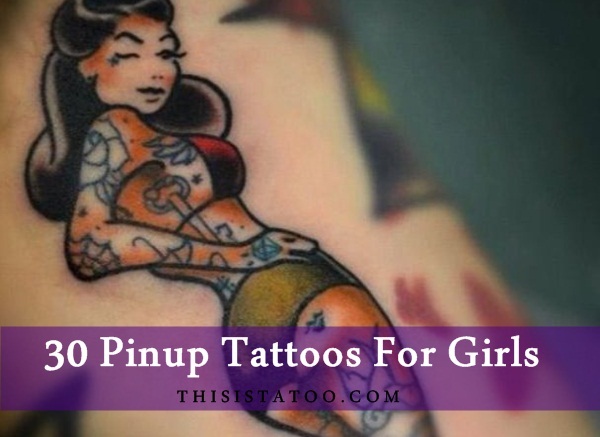 Pin-up tattoos have since been worn by many women symbolizing a sense of beauty, fun, and female strength. Sailors got them as a reminder of the women they missed. 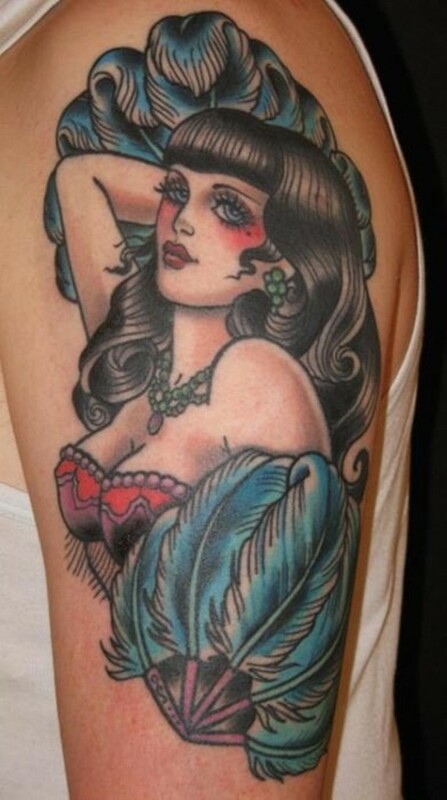 Pin-up tattoos are traditional tattoos that do not always have one specific meaning. 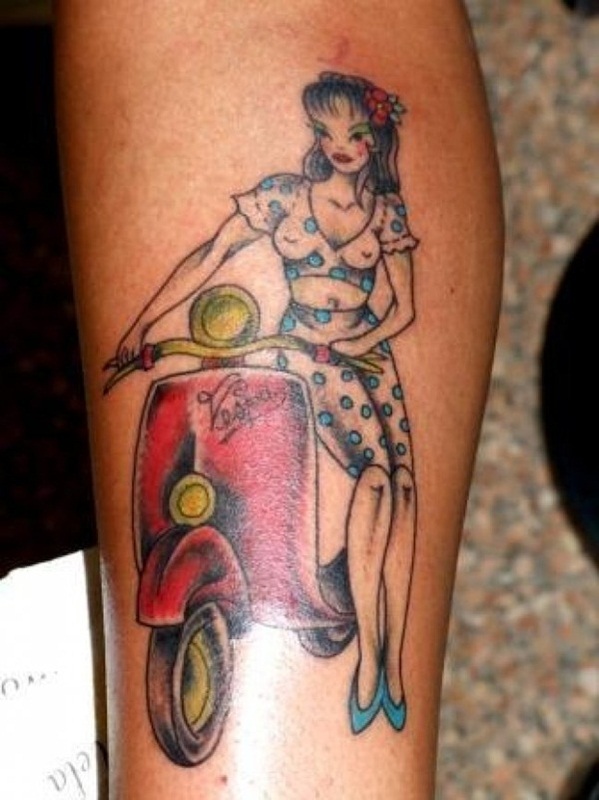 In pin-up tattoo a girl is designed on a body part. 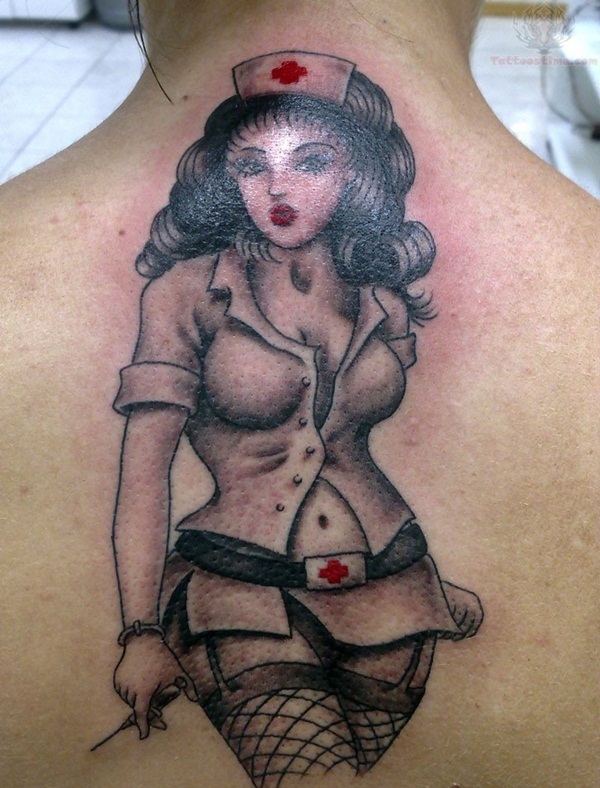 With new designs of pin-up tattoo, even the women are seen sporting the pinup girls on their bodies too. 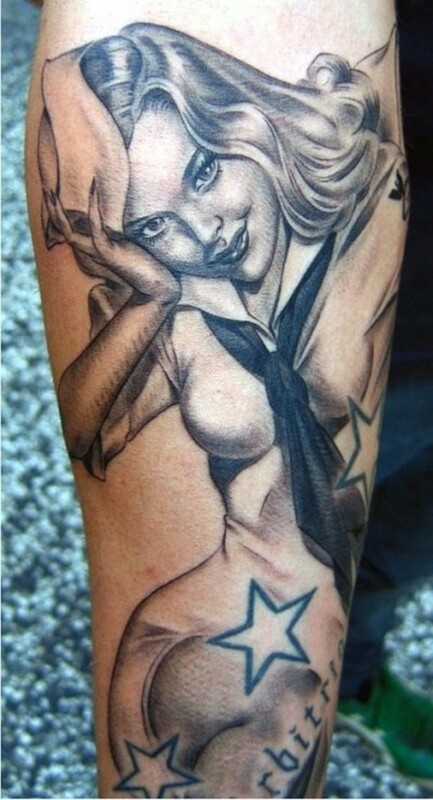 You can make these pin-up tattoos more interesting by using a certain theme for your pin-up girl. 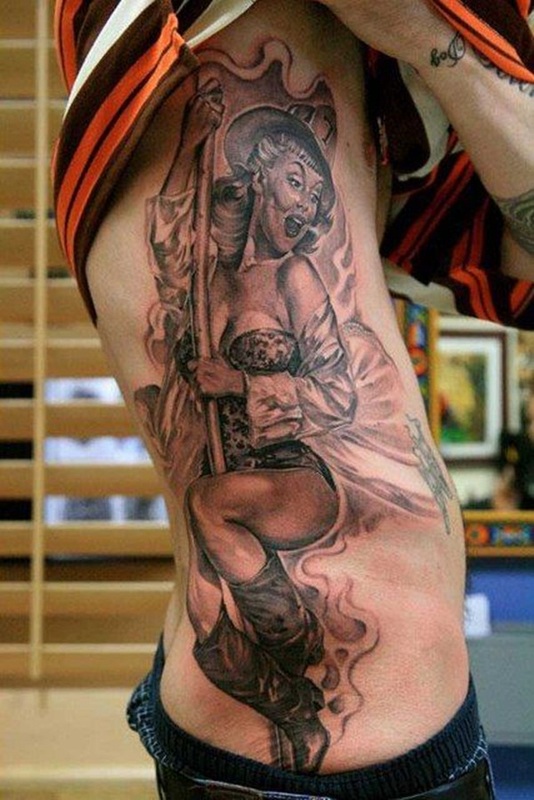 Now days, the most popular choices of pin-up tattoos are devil, angels and warrior-princesses. 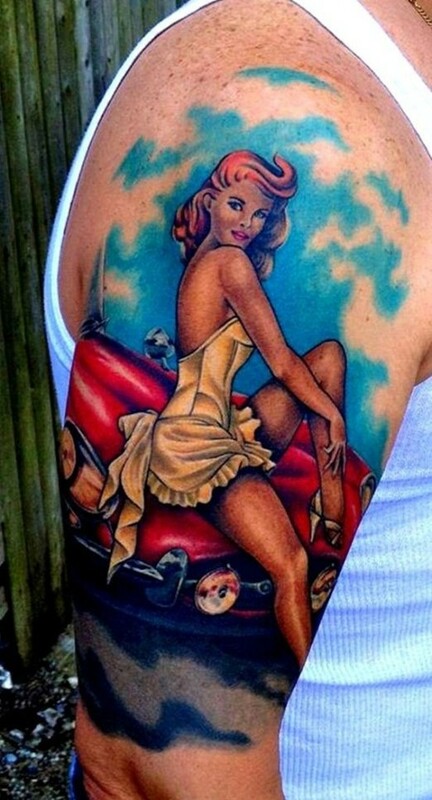 The other styles of pin-up girl tattoos are tattoos of real life women. The term, Pin-up tattoo was first attested to in English in 1941; however the practice is documented back at least to the 1890s. Pin-ups tattoo were the artwork, shows idealized versions of what some thought, particularly beautiful or attractive woman should look like. Some people ask their artist to draw a pin up girl that resembles a certain individual. The pinup tattoos are usually drawn or pictured as a girl wearing a short skirt or bathing suit posed against an anchor or in a wine glass. 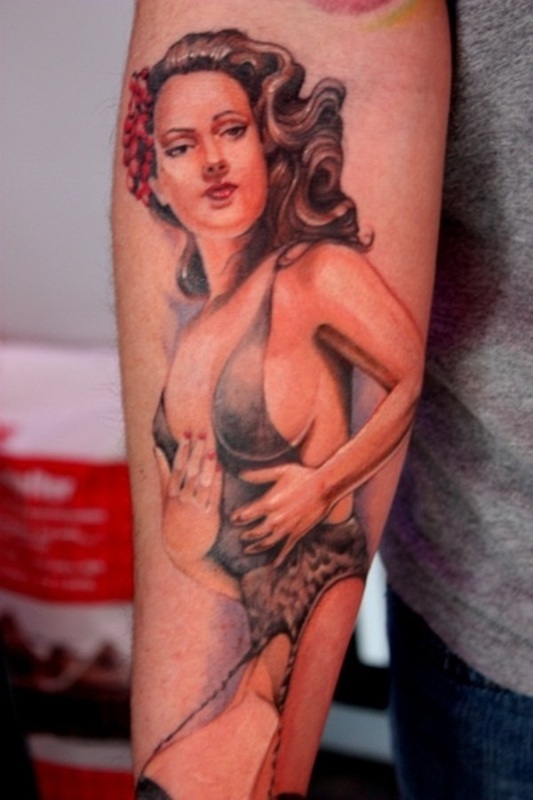 The best pin-up tattoos are those that remind people of the past. There is a very distinct look to the pin up girls of the past that is all-inclusive. You can look through books of classic pin-up tattoo pictures to find the one that is right for you. Make sure that the look is not simply achieved with the pose of the pin up girl also consider the hair, costume and makeup. Your tattoo needs a lot of surface space to design. Choose the best pin-up location as per suggested by your pin-up artist. 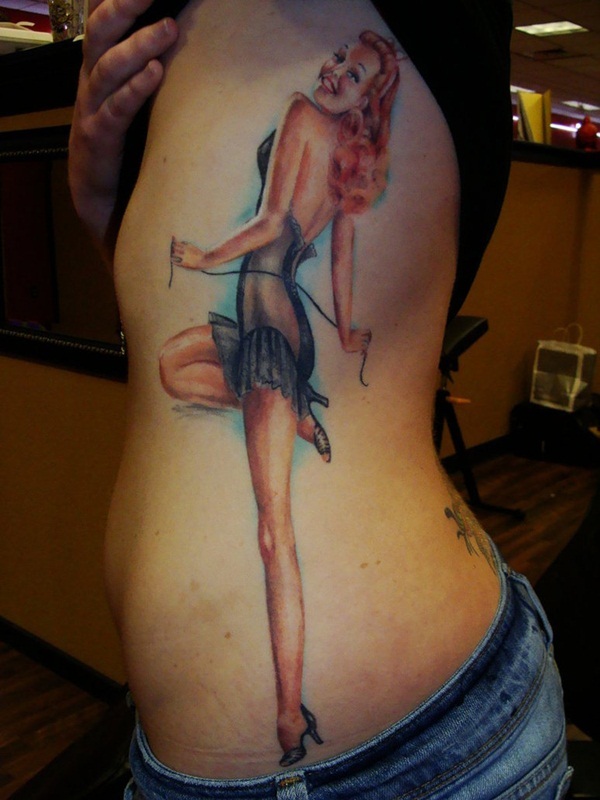 The design of your pin up tattoo is limited by the amount of space in its location. 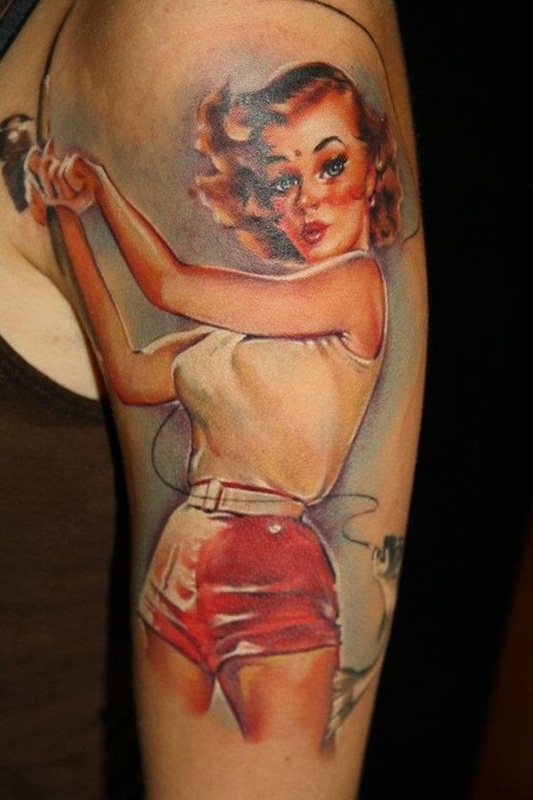 The best place for pin-up girl tattoos is the upper arm around the bicep. 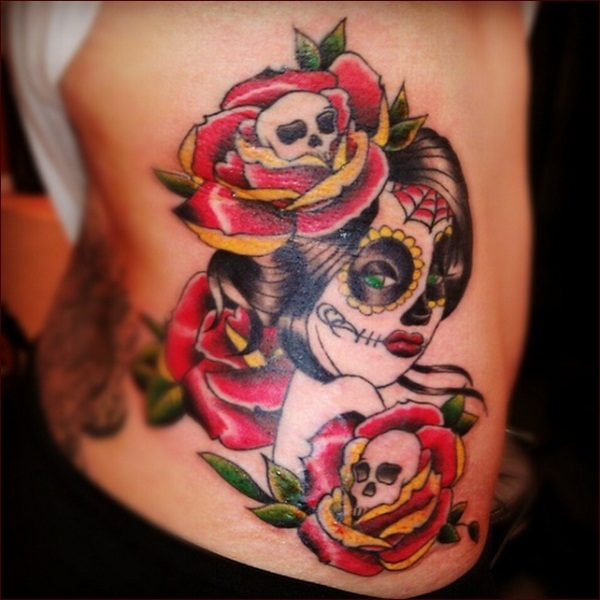 With pin up tattoos, there is always a risk that the tattoo looks bawdy. 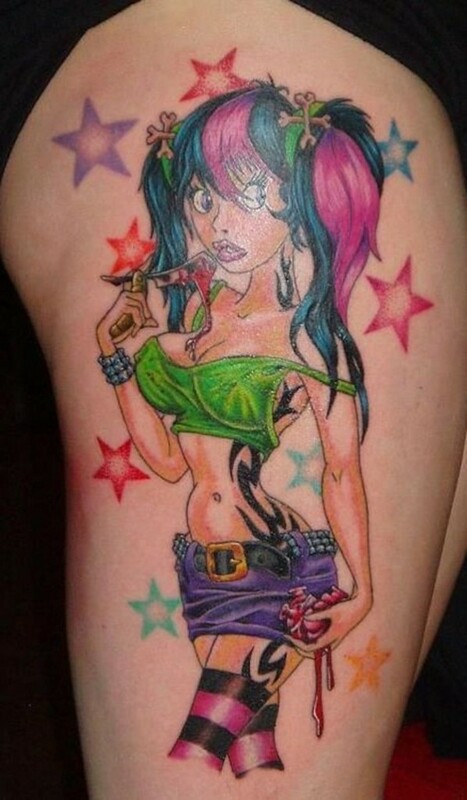 Make sure that your tattoo is ready to meet the world by picking a pose that is not too sexual. 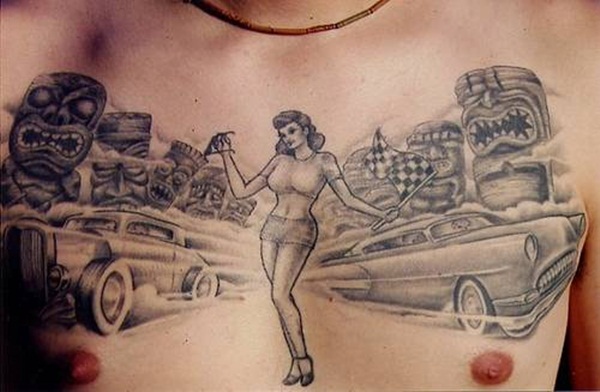 The pin-up girl of the tattoo should have all important parts covered up in order to make the tattoo appropriate for all settings. Research your tattoo artist. The artist should be fantastic with colour and shading. Your design only works when it is done well and appears life-like. Also confirm and check that your tattoo artist has done other pin up also. Do not forget to look through your artist pin-up book. In straight up and down pin-up design the girl is standing straight, many times in high heels or on her tip toes. Girl backside facing forward and head turned at top. 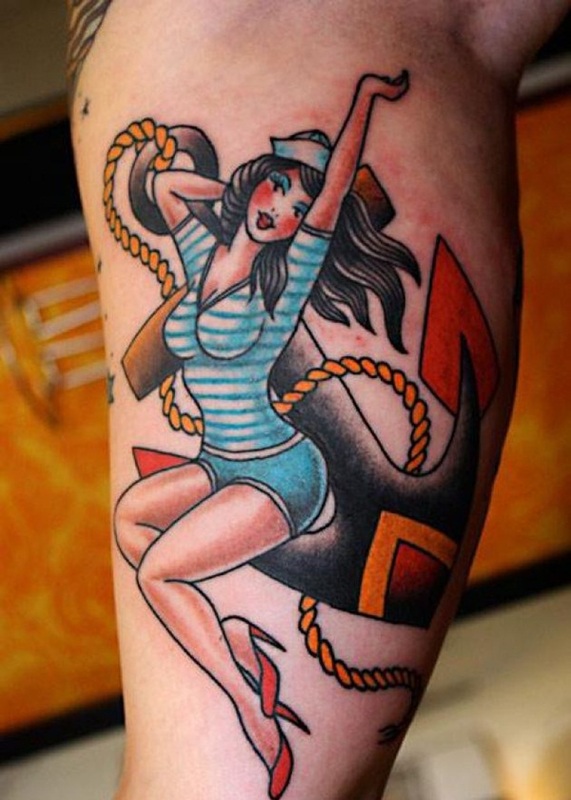 These pin-up tattoos are the best for the forearms and calves. In this type sometimes the arms will be raised and hands clenched behind the head while the body curves and sometimes the girl will be kneeling. 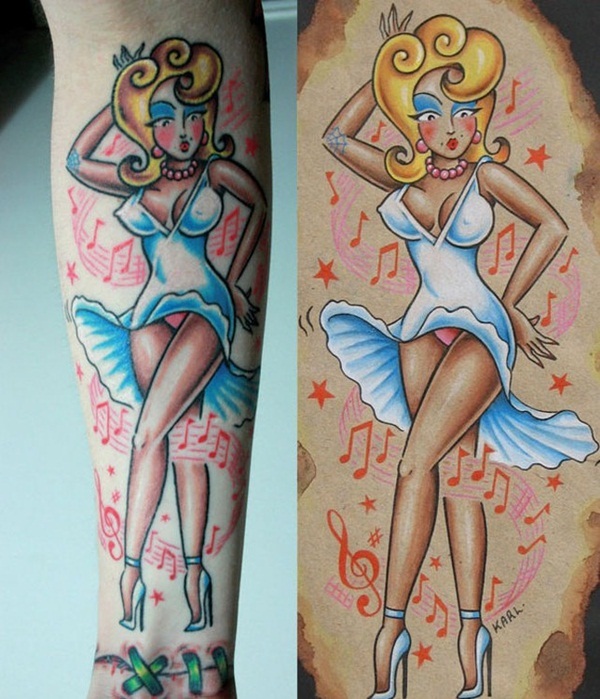 The curvy pin-ups tattoo has more shape to them. Curvy pin-up tattoo is best for upper arms, shoulders and back. In this legs are high kicking in the air and the girl is seated or lying down, or the legs will be crossed while seated. 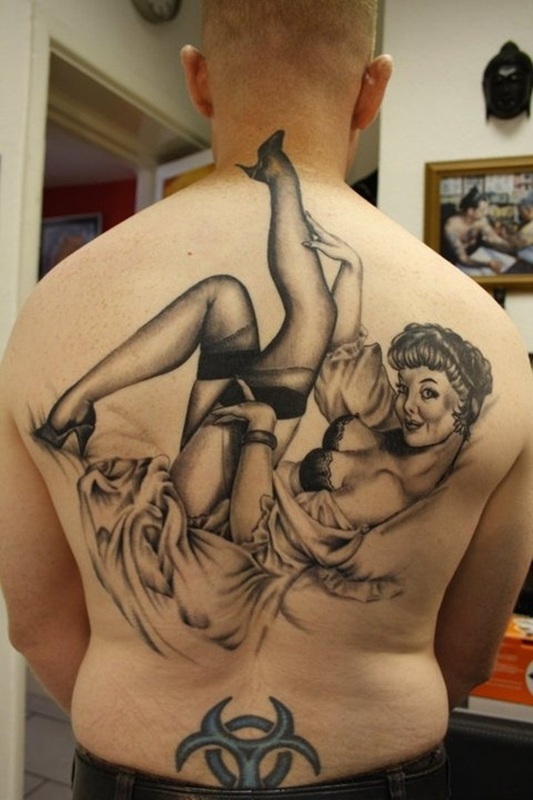 This is the best pin-up tattoo. It emphasizes the legs. There are other variations also. These can work on the inside of the upper arm and upper chest and also on thigh areas. Hi there im jess I’ve just had a pin up tattooon my back as a cover up and the shading is darker than I wanted she didnt even ask what shading id like. Is there any way I can email you a picture and tell me what you think.